Within Québec, 78% of the population primarily speaks French and just 7.6% primarily speaks English (around 0.8% are natively bilingual, and around 12.3% speak primarily something other than English or French). For Couillard to win the April 7 election and become Québec’s next premier, he has to win at least a respectable showing among the Francophone community — polls show that the Liberals win between 70% and 80% of the province’s Anglophones, but that Couillard had been narrowing the PQ’s longstanding advantage among Francophones, many of whom don’t favor independence but who still feels threatened by the encroachment of English within Québec. During the debate, François Legault, the leader of the center-right Coalition avenir Québec (CAQ), which occupies a hazy space between the PQ’s separatism and the PLQ’s federalism, used the opportunity to attack Couillard, arguing that he was ‘hesitant’ to defend French and that the Liberal leader is ‘incapable of defending Québec values,’ a charge that Couillard called insulting. But sure enough, the CAQ released an internal poll conducted by CROP showing that, among Francophone voters, the CAQ is on the rise (though there’s been an odd lack of polls in Québec since last Thursday’s debate, especially given that the election is next Monday). Polls throughout the campaign have shown that the CAQ will struggle to retain its support from the 2012 election. “I’m flabbergasted to hear Mr. Couillard tell us that there is no problem with the French language in Quebec,” said Marois. In political terms, it seems like an error for Couillard to have continued to discuss bilingualism over the weekend. He made it clear that he believed that the provincial government should continue to protect the French language, but that bilingualism — for both native French and English speakers — is an asset in a globalized economy. It’s not the first time that Couillard has stood by a controversial position on principle — though polls show that Québec voters largely support the Marois government’s ‘charter of values,’ Couillard has attacked it as discriminatory and unwelcoming. Montréal is perhaps the best example of bilingualism in Canada — around 56% of its residents speak both French and English. Not surprisingly, perhaps, it’s home to Québec’s largest Anglophone community and it’s a Liberal stronghold. The current language debate dates back to 1977, when the first PQ government of premier René Lévesque enacted La charte de la langue française (the Charter of the French Language), popularly known as Bill 101, which established French as Québec’s national language, and established wide-ranging rights to Québec citizens. The charter has been amended several times throughout the years, including a significant expansion in the 1980s by Liberal premier Robert Bourassa. Today, Bill 101 provides that the Québecois have a right to French-language civil administration, health and social services, public utilities and other government departments. It also enumerates the the right of workers to use French, the right of consumers to be served in French, and the right of students to receive education in French (at least from kindergarten through secondary school). In particular, the mandate that all commercial materials, from menus to signs to product labels, be written in French, has caused significant controversy throughout the years — English may be listed alongside French, but not in a way that’s more prominent than French. The Office québécois de la langue française, derisively referred to as the ‘language police’ outside Québec, is responsible for implementing French language policy. 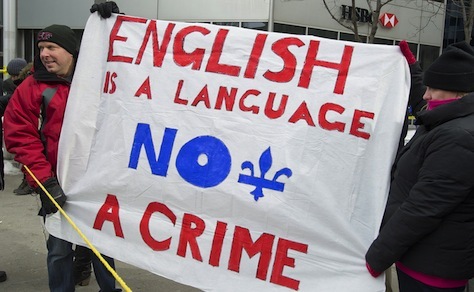 In the years following Bill 101’s enactment, the number of native English speakers in Québec declined, as it became increasingly difficult to find English-language schools or an Anglophone business community. Bill 101’s passage probably facilitated Toronto’s rise as the indisputable financial capital of Canada, a status that had previously belonged to Montréal. By the late 1970s, however, Toronto was very much on the rise, with or without the French language charter. giving language inspectors much more power to gather evidence of charter violations. Last March, though, Québec was ridiculed in the international media when language officials attempted to ban the word ‘pasta’ on an Italian restaurant menu in Montréal — and, for good measure, cited the owner’s use of the Parisian French steak frites instead of the Québécois French biftek. With a minority government, Marois and the PQ simply didn’t have enough votes to pass Bill 14, and they quietly dropped the push to enact later in 2013, turning instead to the secular values charter instead. “During the nine years under a Liberal government, we saw a decline of the French language, particularly in the Montreal region,” she said. While Marois acknowledged there’s nothing wrong with being bilingual, Marois said Quebecers must stand up for their right to speak and work in French. “If you want to be bilingual, I agree with you as a person. But as an institution and as government, I think the official language of Quebec is French and we don’t have to be bilingual in our institutions,” she said. Meanwhile, Couillard continues to argue that Marois will start planning a referendum as soon as the PQ wins a majority government. Marois, not helping matters, has pledged not to hold another referendum until after consultations and until ‘Quebeckers are ready for one,’ hardly a clear response. Polls show that most voters don’t want Québec to hold another plebiscite on independence. That means the rest of the campaign — and Monday’s election — will come down to a poisonous debate over cultural issues. The Liberals hope to scare enough soft sovereigntists away from giving the PQ a majority government, the péquistes hope to scare enough Francophones away voting Liberal by alleging Couillard’s hidden Anglophone agenda, and Legault and the CAQ hope to win over voters now turned off by both the independence and language kerfuffles. Photo credit to Canadian Press/Graham Hughes. Previous PostUS ambassador to India resigns a week before Indian electionsNext PostWho is Alexander Pechtold?